Maybe it’s an age thing. Sometimes a memory comes to you, a memory that perhaps you hadn’t thought about in decades, and then for some reason you find yourself thinking about that memory several times a week, over the course of months. And maybe, if you’re like me, you lay awake at night, trying to walk into that memory, and take it all in, dig up details that you’d forgotten or maybe identify components that you had not even noticed at the time. Also, you might ask yourself, why now? Why have I been flashing back to this memory so often of late? The summer before my senior year in (Bible) college, I interned at a church in a suburb of Syracuse, New York. I worked with the youth and preached a couple of sermons, helped out where needed. I stayed with the minister of the church. I’ll call him Tru. For that summer, he and his wife were my parental figures. He had spent a lifetime in ministry, had had one decades long ministry and had only recently started ministering to this suburban church. His wife was, to me, the perfect preacher’s wife. She was funny and kind, appeared to be a good judge of character, a good cook. I think she even played the piano. In the first few weeks of my internship, Tru’s wife went to stay with one of their daughters who’d just had a baby, so for two weeks, it was just Tru and me in the house. I missed her presence, I’ve always felt more comfortable around women than men, especially straight men. This story isn’t so much about Tru. I’m just unpacking a memory here, and I’m not sure what parts of it I’m going to need. One afternoon, Tru took me to the birthday party of one of the older ladies in the church. The lady was a leader in the church. I’ll call her Lily. It seems to me that her husband had died not long before that summer. She was kind, welcoming and encouraging. As we drove there, Tru, who had a tendency to repeat himself, told me for what was probably the 4th or 5th time, that Lily’s brother who was welcoming us into his home was a homosexual. He told me that the brother had lived with another man for many years. As we drove to their house near a lake, he told me how that particular part of Syracuse was home to a growing number of homosexuals. I was from Kansas, was now living, for the summer, in the suburbs, and this old, historical part of the city seemed to me another world. My frame of reference being limited, it reminded me of the neighborhoods of Georgetown that I’d seen in my favorite movie, St. Elmo’s Fire. But on a lake. It was an idyllic location. Of course, that entire summer, I feared that Tru and the entire congregation would discover my secret. As Tru talked about the men, I tried to imagine what they would look like. Would they be more like Michael Ontkean and his lover at the end of Making Love or like the couple in La Cage Aux Folles? Would they, could they, suspect my secret? We arrived at the house while the party was in full swing. The brother and his partner both looked like gay Dennis Farinas. They welcomed us into their home. There were antiques. There was a lot of food. Big plates and bowls of pasta and antipasto and salad and lasagna and Italian sausage and meatballs. Tru had predicted that the food was going to be very good, in part because these men were homosexuals, and that turned out to be true. How long were we even there? An hour? I remember eating at least two plates of food. Meeting people who were fascinated to learn I was from Kansas. 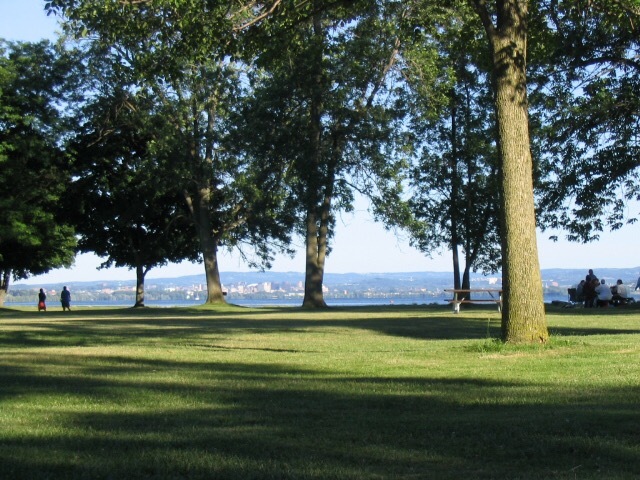 (“You’re not in Kansas, Dorothy!”) It was a beautiful June Sunday afternoon in Syracuse by the lake. Does it get much better? I remember the sun spilling through the windows into the living room that contained so many people, so many antiques, so much food, so much life. And then we left. As we drove back to Liverpool, Tru pointed out that he’d predicted right. “The food was good, wasn’t it?” He talked about how the men were good men, just, you know, lost. I don’t think I thought once about that day in my thirties. I don’t know why. And I don’t know what made it pop into my head a few months ago. Like a lot of memories, it comes with more questions than answers. Was it hard for Lily, in 1989 to be a deeply religious woman and have a close relationship with her gay brother? She seemed to adore him. Did she think her brother was going to hell? Did she pray for God to change him? I don’t even know if Tru and his wife are still alive. We lost contact years ago. The last time I saw them I was living in New York City and visited for a weekend. I had come out to myself, all who knew me in NYC, knew I was gay, but I did not come out to Tru and his wife. I’d only come out to my real parents months earlier and it was hard enough. Would it have meant something to me if I had told them I was gay and they had had the chance to tell me they still loved me? Is that what they would have told me? I don’t know. I do think I know why I keep thinking about it now. And I suspect it even goes back to that Rhinebeck fantasy of mine. The luxury of only knowing someone for an hour, is that there is a really good chance that that person, or those people, can end up seeming kind of perfect. Does it matter that it isn’t always June in Syracuse? Maybe it does and maybe it doesn’t. They were the first gay couple that I ever met. They were the age that Eric and I are now. What did I or do I know about the intricacies of their relationship? Very little. But in my hazy, gauzy, sun-spilled memory, it occurs to me now, and only now, the gay Dennis Farinas had everything I could hope for. A beautiful house filled with beautiful people on a beautiful lake on a beautiful day.